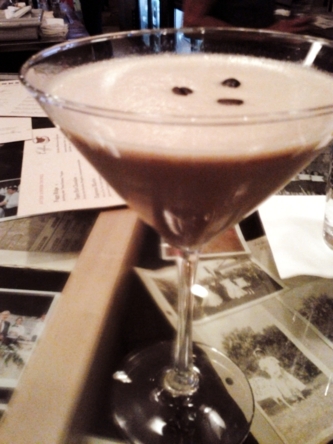 The espresso martini is hiding on Watt’s dessert menu. Combine a shot of Joe Van Gogh’s espresso, Stoli Vanil vodka, Chambord liqueur, and a splash of Bailey’s Irish crème liqueur, and you have a unique coffee cocktail that still manages to hit all the elements I expect from one. First of all, the aroma of this drink was wonderful, and the frothy presentation with three little beans was quite appealing. The taste of the espresso comes though nicely without bitterness and imparts a welcome nutty note. The raspberry flavor is light and rather soothing in combination with the Irish crème. None of these ingredients overwhelm each other. They simply work well together to make a delicious drink.